Why does my team much prefer using Slack? As a project manager, optimizing efficiency is a key part of my job. As a result, I’m very interested in productivity apps and team communication platforms. I wanted to share my experience of transition from Slack to Workplace, and the reasons I think Workplace has failed to stick. I think this is important to document for several reasons. First is the expense. It’s a gambler’s fallacy to think that sunk costs are a reason to keep doing something; however, Facebook and companies considering the switch to Workplace should weigh up the expense of the transition against the success of case studies. Second is David Allen’s commandment that everything should be captured in one system. If communication and task management are spread between e-mail, Slack and Workplace (as they currently are for my team) the context switching and confusion of these systems will inevitably need to inefficiencies and mistakes. I was not involved in the rollout of Workplace at my company, I am merely the target user. As a result, I do not have access to the analytics which would give clear data on adoption and engagement rates across the platform. I can only speak to my own experience. Before I started at this organization I was already a committed Slack-user, belonging to five personal interest Slack groups: three related to org design and the Future of Work, one for my family, and one for organizing my wedding. I use classic Facebook for the sole purpose of messaging old friends whose email addresses I don’t have. I recently installed the Facebook News Feed Eradicator Chrome extension and wish I’d done it earlier. So why were we encouraged to use Workplace? Before getting into why Slack is so much more effective for our team communication, it’s only fair to explain why Workplace was considered in the first place. Those who hadn’t used Slack for long or at all remarkably responded to be in favor of the switch to Workplace pointing out to fact that it’s much easier to use and more fun. Workplace doesn’t have the same issue. Facebook announced at their launch event in London that they aim for Workplace to appeal to everyone from CEOs to factory workers to baristas. I can understand that Slack’s bright colors, whimsical copy, and always-on nature appeal to millennials who are always on at least one screen and so accustomed to the information overload, real-time chat bright colors and interfaces of modern apps. Another feather in Facebook’s cap is that it surely won’t suffer the growing pains of a start-up that is barely 3 years old, as Slack does. 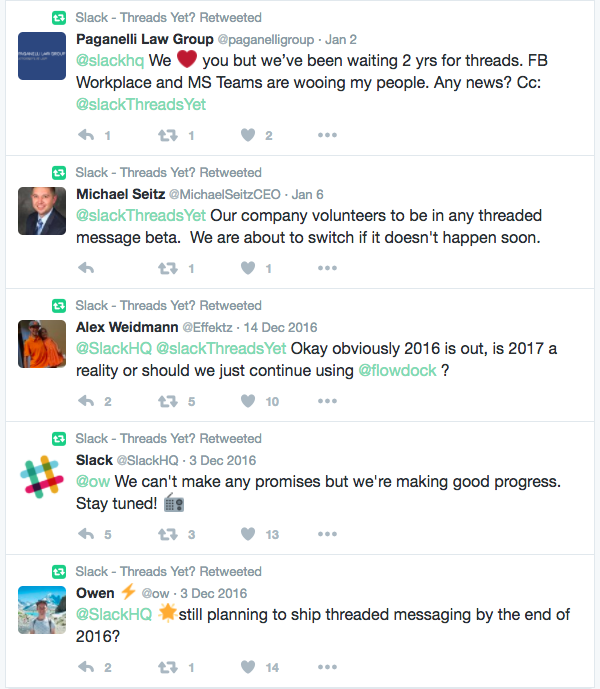 Slack suffered a significant service interruption in December. Thankfully my office was closed that day, but this must have had a significant impact on all teams who run solely on Slack. I have much more faith in the infrastructure, servers and expertise of Facebook to prevent this kind of downtime with Workplace. Thirdly, Workplace has been great for sharing stories globally across our agency’s network. That said, Slack have recently relaunched their homepage changing their core message from “Messaging” to “where Work happens” — perhaps this is in anticipation of the rollout of Slack Enterprise which promises to bring together teams in an organization currently siloed into various Slack groups with no cross-pollination. So why have we stuck with Slack? The one reason my team are still actively using Slack is because Workplace are yet to open up their multi-company groups feature (though it has been promised). As a data-driven digital strategy team, swift communication and collaboration with clients is essential to be able to respond in real-time to cultural triggers and global conversation. However, the general feeling is that we’re glad that Workplace doesn’t have this feature yet, as it means that we don’t have to use it. Clearly, there is a deeper resistance to Workplace. It could be argued that people simply don’t like change and it takes time to grow accustomed to any new software, but Workplace’s entire selling point is that it isn’t a change and everyone already knows how to use it. I’d argue that this isn’t actually the case: it is far from intuitive how to replicate Slack channels in Workplace: are Channels now Groups? Or should we use the Messenger feature as a new Hangouts? What does an Open Group mean? Why would I want to Follow someone who may be posting to groups that don’t concern me? Sure they can close the group to prevent spamming followers, but this locks off all of the information within, making Workplace no better than email at making information available. I think the problem is that while the interface is familiar (although somewhat dried up by varying shades of grey), the purpose is unclear. Facebook has never been about communicating coherently or about Getting Things Done — it’s actually the opposite. Since I quit Reddit as part of my New Year productivity drive, Facebook is my go-to brain break. I go to Facebook precisely to do nothing (and it has the benefit over Reddit of being fairly uninteresting — so I get back to work quicker!). While my Workplace feed is an entertaining place, it’s not what I need to do get my job done, and it fulfills its purpose of being tremendously distracting. The social network that Zuckerberg built tapped into something about how humans communicate and organize themselves as social animals, not as coworkers or collaborators. Social networks are effective for sharing information about your personal lives because it doesn’t matter if your network miss a post and it doesn’t matter if the information they do receive is randomized. Businesses require a much more focused flow of information, with that information tailored to each user so that it does not become overwhelming. Workplace does allow you to tailor your feed but the options within the notification system are not as granular as Slack. There are no options to join channels, to mute them to snooze notifications. The root of this problem may lie in the genesis of each product. Slack began as an internal tool used by their company to develop an online game. The game is defunct, but the tool remains. Having worked in game development, I can see why the need for a focused communication tool was essential to help teams operate. Slack’s founders understood how teams work. Workplace’s founders understand how social networks function, and while they’re clearly good at operating large organizations, the principles of social networks and the principles of effective, collaborative teams are not one and the same.